Hwy. 1 & Comptche-Ukiah Rd. Pets Welcome! is not just a saying at the Stanford Inn. It’s a decades-old commitment from owners Joan and Jeff Stanford: All significant family members can share the experience of the Stanford Inn. We have always traveled with our dogs, Murphy and Ellie, and welcome your friends here. Over the years we have had a variety of non-human visitors: dogs and cats, of course, but also iguanas, parrots, Vietnamese pot belly pigs, and a tortoise. If yours is a dog, you'll find a welcoming treat, stainless steel food, and water dishes, "dog sheets" to protect the furniture so your friend can snuggle with you, Intelligent Products pick-up bags and more. The guest rooms and suites of this boutique hotel in Mendocino include a host of amenities; including an indoor pool, hot tub and sauna, plus a fireplace, private deck, HDTV & DVDs, free wi-fi, coffee maker and refrigerator in every room. Every detail is attended to, from wood-burning fireplaces set and ready to light to the sumptuous chef-prepared organic breakfasts. Inspired by the Stanford’s Certified Organic gardens, Ravens' Restaurant is outstanding and nationally acclaimed for vegetarian cuisine. Guests at Stanford Inn, as well as local Mendocino residents, consider Ravens' Restaurant to be an essential dining experience on the Mendocino Coast. The Inn’s Massage in the Forest and The Mendocino Center for Well Being provide a variety of life-enhancing experiences, including massage, facials and Ayurvedic Treatments. If you can manage to pull yourself away from the comfort of the Inn, there is canoeing, kayaking or mountain biking along Big River in California’s new State Park right out the front door. 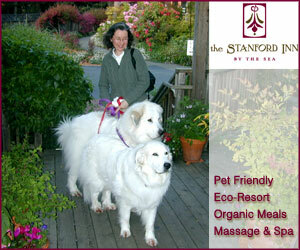 Mendocino's Stanford Inn & Resort is pet-friendly and family-friendly; welcomes meetings, group retreats, weddings and elopements. One of the first North American inns to adopt sustainable practices beginning the green revolution, the Stanford Inn also offers technological conveniences, including cellular phone service - both GSM and CDMA cell phone service available from antennas housed at the Inn - and complimentary high-speed wireless internet.